Why Choose Dr. Mark E. Pruzansky? Why Dr. Jason S. Pruzansky? An extension at the bottom of the ulna where the wrist’s pinky-side collateral ligament attaches. An extension at the bottom of the radius where the wrist’s thumb-side collateral ligament attaches. A cashew-shaped bone close to the thumb that links the wrist’s two rows of carpal bones. A crescent-shaped bone located in the middle of the first of two rows of carpal bones comprising the wrist. A pyramid-shaped bone close to the pinky in the first of two rows of carpal bones comprising the wrist. A table-shaped bone close to the thumb in the second of two rows of carpal bones comprising the wrist. The trapezium is the foundation of support for the thumb, responsible for pivoting and necessary for opposition, prehension and grasp. A wedge-shaped bone located next to the trapezium in the second of two rows of carpal bones comprising the wrist. The trapezoid is the foundation of support for the index finger. The largest wrist bone located at the center of the two rows of carpal bones comprising the wrist. The capitate is the foundation of support for the middle finger. A hook-shaped bone located next to the capitate in the second of two rows of carpal bones comprising the wrist.The hamate is the foundation of support for the ring and little fingers. A pea-shaped bone close to the pinky in the second of two rows of carpal bones comprising the wrist. A small pad of cartilage similar to the meniscus of the kneethat cushions the wrist joint where the ulna meets the lunate and triquetrum carpal bones. A cord-shaped ligament that attaches the ulnar styloid on the pinky side of the wrist to the triquetrum carpal bone; also the floor or sub sheath of the extensor carpi ulnaris tendon. A strong, fibrous band of ligamentous tissue that crosses over the carpal bones to form the roof of the carpal tunnel through which the flexor tendons and median nerve travel to the hand. 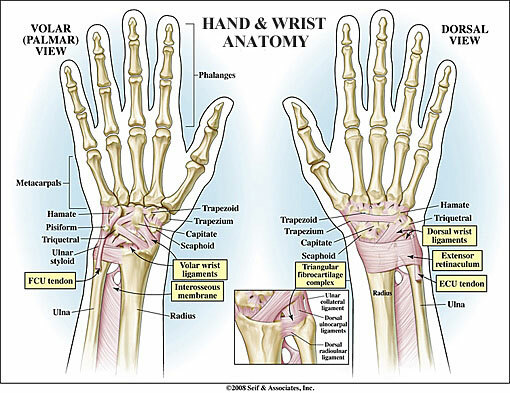 It is attached on the pinky side of the wrist to the triquetrum and hamate bones and, on the thumb side, to the scaphoid and trapezium bones. A ligament that attaches the radial styloid on the thumb side of the wrist to the scaphoid carpal bone. The tendons that attach the forearm flexor muscles to the finger and hand bones on the palm side of the hand and wrist and serve to curl the fingers and thumb and bend the wrist. The tendons that attach the forearm extensor muscles to the finger and hand bones on the backside of the hand and wrist and serve to straighten the fingers, thumb and wrist. The muscles attaching to the medial epicondyle and running down the front of the forearm that serve to flex the wrist and hand. The muscles attaching to the lateral epicondyle and running down the back of the forearm that serve to extend the wrist and hand. One of three nerves originating at the shoulder that carry signals from the skin and joints to the brain and back again to the muscles of the upper extremities to coordinate movement and position sense. The radial nerve begins from the inside of the upper arm, travels diagonally across to the outer elbow and then again crosses to the thumb side of the forearm and into the back of the thumb, index and half of the middle finger. Muscles controlled by the Radial Nerve include the triceps and wrist and finger extensors. One of three nerves originating at the shoulder that carry signals from the skin and joints to the brain and back again to the muscles of the upper extremities to coordinate movement and position sense. The median nerve begins from the outside of the upper arm and travels down the inner side of the upper arm before moving to the center of the forearm and into the palmar side of the thumb, index, middle and half of the ring finger and distal segment of the thumb, index, middle and ring fingers. Muscles controlled by the Median Nerve include the wrist and finger flexors. One of three nerves originating at the shoulder that carry signals from the skin and joints to the brain and back again to the muscles of the upper extremities to coordinate movement and position sense. 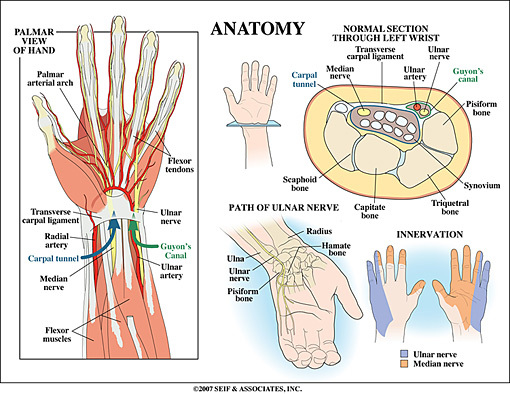 The ulnar nerve begins from the inside of the upper arm and travels down the inside of the forearm and into the palmar and dorsal sides of the pinky and half of the ring finger. Muscles controlled by the Ulnar Nerve include the wrist and finger flexors, as well as the small muscles in the hand that coordinate fine movements. The artery branching off the brachial artery below the elbow that brings oxygenated blood down the pinky side of the forearm and into the wrist and hand. The artery branching off the brachial artery below the elbow that brings oxygenated blood down the thumb side of the forearm and into the wrist and hand. Sacs containing lubricating fluid that serve to reduce friction between tendons and bones and skin and bones. 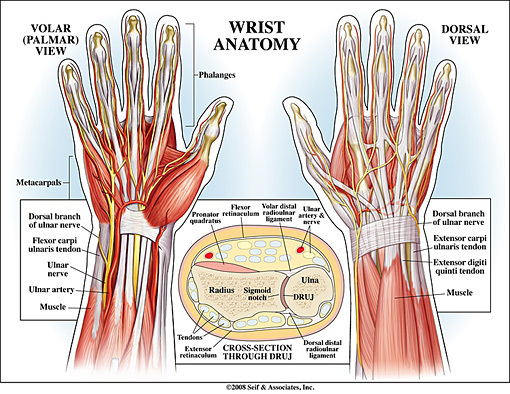 Learn about ligament injuries of the wrist. To be the leader in hand and upper extremity surgery and the treatment of sports injuries, and a compassionate doctor in patient care and education.